Part of good diabetes management is eating healthy foods. If you are looking for a diabetic-friendly and nutritious snack, look no further. Pomegranates are usually available from October through January. They're the perfect winter fruit and are full of fiber and are rated high on the list of healthiest foods. Fiber is an important dietary component for everyone, but it's especially helpful for diabetes. Not only can a high-fiber diet reduce the risk of developing diabetes and heart disease, but it can also help manage diabetes because it fills you up, not out. Incorporating high-fiber foods into your diet might take some getting used to, but once you know which swaps to make, you should find that it's not only easy (and delicious) but that it's more filling, leaving you satisfied longer. A pomegranate is the berry of a small tree that grows from 5 to 8 feet tall and is native to Persia. Pomegranate has been cultivated for years throughout Asia, the Middle East, Africa, the Mediterranean, and Eastern Europe, and was introduced to the Americas by the Spaniards. Pomegranates are harvested when they about the of a large orange. They have a thick, leathery, crimson-red skin. Dozens of small seeds, known as arils, are clustered in compartments between a bitter, inedible cream-colored membrane. These seeds are considered a symbol of good luck and fertility by many cultures. Pomegranate is available year-round with local varieties available in October and November in the United States. The seeds find their way into appetizers, soups, salads, main courses, and desserts. 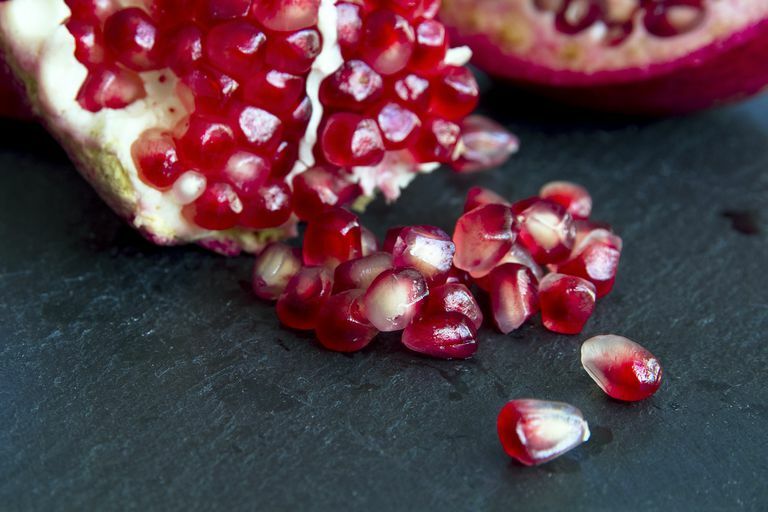 Did you know ancient Egyptian women used pomegranate juice to color their lips? Did you also know that pomegranate juice is still used to dye fabric today? That's because the juice stains almost indelibly. To collect the seeds without staining clothing, some people submerge pomegranates in a bowl of cold water while peeling. Pomegranate juice has been shown to improve heart health, protect against prostate cancer, slow cartilage loss in arthritis, help diabetics, and is high in antioxidants which can protect the body from free-radical damage and cancer.